It's day 2 of holiday giveaways, and today's is brought to you by the ever-so-lovely Florence Adams! If you aren't already aware of this lil' shop, Florence Adams has everything for the modern day woman who loves to create, is always inspired, and keeps it classy doing so. With everything from juicers, to vintage aprons, to lavander soap, to cozy sweaters (like this one I am wearing above), Florence Adams has it all! So with that being said, I am so excited to present you all with the opportunity to win a $50 giftcard to their lovely shop! 3.) Go to the shop and pick your favorite item and tell me why in a comment below. Good luck to all! Giveaway ends 12/28 at 11:00pm EST. I love the leopard print jacket. Liked on Facebook! My favorite item is the Bib Josephine Cottage Kitchen Rose Apron. I love to bake and have been wanting a vintage-y apron for a long time, but find myself being picky over patterns. This one is so pretty though! I like Florence Adams on Facebook (as D'Aundra Wallace). I think my favorite clothing piece is the Black/White Pullover Sweater because it's a basic that I know that I can wear all year long -- perfect for the light winters in Arizona and ideal for the ice-cold indoor temperatures during the summer time. I really love the idea of eating more raw foods; I don't think I want to be a complete raw foodist, but I think that it is better for your body to eat more foods raw, and I know my mother feels that way too. I love this specific one because of the space, size, and quality. I hope to have one in the future! The Baboushka Amelia apron would be perfect for baking! So cute! I like the navy blue infinity Scarf!! 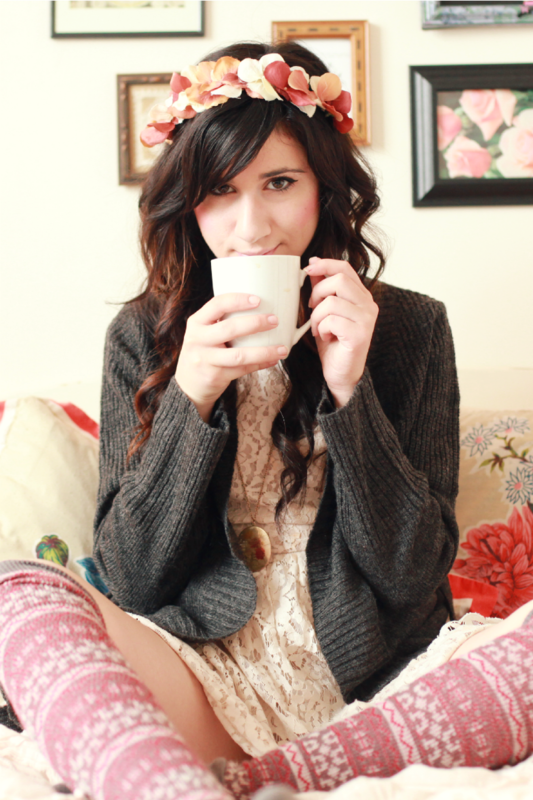 I love the Black/White Pullover Sweater because it's cute & great for winter. Looks really comfy for winter. I'm torn between this (pretty) and a jacket (useful), but I chose the Bib Josephine Cottage Kitchen Rose Apron. I cook a lot, so it's still useful... yeah? 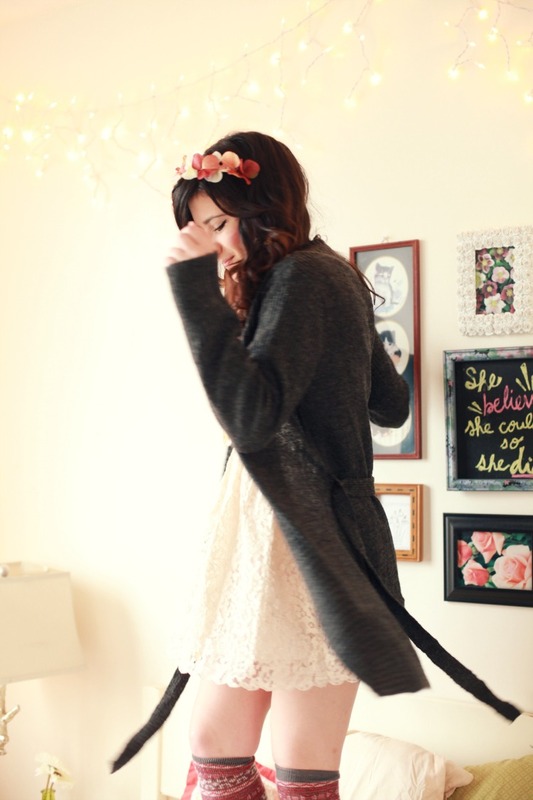 I love the Grey Tie Sweater because it would be a perfect addition for winter outfits! super cute outfit!!! <3 i love everything!!! why: Ive been looking for one in this color for so long!! and I had never heard of this site before, so thank you! Im happy I found one! You have such a lovely blog! I absolutely love it. The Mocha Colored Blocked Tie Cardigan is my favorite thing because it is so chic and feminine! love this sweater! favorite item = ecru pockets blouse because it looks like a perfect simple staple, but with a little polish! love your florals in this post!! I want the Grey Tie Sweater!! I love the Bib Josephine Cottage Kitchen Rose Apron! Bonnie you and Christina really make me want a floral headband! I'd get the Black and Navy Rollover Waistband Knit Skirt. It's so adorable! I love the Apple Green 8 cup Cafetiere because I've actually never seen a french press in a fun color! Liked Florence Adams on Facebook. I like florence adams on Facebook. My favorite item is the black blazer, its a very classic piece i love it! I think my fav items are between the cream faux fur collar cardigan, the cream tie sweater and the Boysenberry Tie Blouse. These are such nice pieces that look so comfortable and can be so stylish with any outfit. I want the http://www.florenceadams.com/beaded-cluster-necklace.aspx because it looks so elegant and beautiful! the deluxe over-the-sink cutting board looks so handy! Liked them on FB and love the Green/brown plaid Coat! Love your flora headband! You always look so pretty! thank you so much for the giveaway! i love your outfit, and i neeeeed socks like those! I want the Excalibur food dehydrator, as a matter of fact...homemade apple chips sound yummy right now. I realy love the simplicity of Florance Adams. Just liked the page on FB and went to the shop. My favorite item is the Color Block Stachel because it's so simple yet so versatile and stylish. I liked them on fb! I love the Black/Grey Faux Fur Sweater! Just looks so cozy and stylish! Liked them on fb as Karla. But I don't really know how I can look older posts of december? Such a pretty outfit. And amazing how well those socks work with the lace dress. my favorite item is the Jade Birdies scarf! I collect scarves! Like Florence Adams on Facebook -- "wild orchid"
Sweater is the bomb love it! Call me crazy but the Beaded Cluster Necklace needs to come home with me! Gah, your style is so awesome! I love the brown leopard scarf because it can go with so many things! I wanna enter the giveawy :) My favorite thing is Diva Delights Fashionista Half Apron. Such a vintage useful thingy. Liked on Facebook! My favorite item is from the jewelry section. The Beaded Cluster Necklace is beautiful! I really like the Bib Annie Denim Apron. The style of it is cute and simple which is something I like with aprons (I'd feel so bad if I got any of the fancier designs and they got dirty, so something simple but cute works for me) Plus, it's simple enough that I can wear it any season of the year and it would totally fit! Also, my boyfriend and I are starting a new life together and this would be a cute little "Home Sweet Home" sort of gift! My favorite was the shoots and ladders plum scarf!!! So pretty, and versatile! I adore scarves because they can really make any outfit amazing...sometimes. Love this series of pictures! You look so cute & cozy! -jb. Alright, so it seems that most people have chosen clothing as their favorite item, but I didn't bother with that. I chose the most interesting coffee machine I've ever seen & I love it! It has the perfect retro look & I think it would look great in my future vintage inspired kitchen. So cute! My favourite item is the Champagne tab blouse, it is so classic and versatile! I love the Red Double Breasted Jacket with Fur Collar because I'm somewhat new to living in cold weather and always on the lookout for a cute coat!! This blouse looks so comfy i think it'll be perfect for my mum. Hi I love the Grey Brushed Back Fleece Jacket as I've been wanting something like this and I can think of so many current things in my closet that this would be perfect with!!! My favorite item was the Mocha Colored Blocked Tie Cardigan. Its a classic 50's style that I'm obsessed with, and it would look great with pearls. I totally love embracing vintage style. Liked Florence Adams on Facebook! My favorite item is the Victorian Rose Tab Blouse! So pretty. Thanks for the amazing giveaway! I like her Beige V Neck Tie Bow shirt!